The BHAF have arranged a planting day at Racehill Farm site to plant nearly 1000 thorny intruder proof whips around the site perimeter fencing in a bid to improve site security. As you can imagine planting 1000 plants needs many hands to make light work (!) so we would like to invite not only Racehill tenants but any plot holders (or just helpful volunteers whether they have a plot or not!) from across the city to come along and help out if you can. It would be a great chance to meet up with like minded people, and share growing tips !! There will also be a PCSO (Police Community Service Officer) attending during the day to hopefully carry out property marking on Racehill site. And you will also be able to find out more about a new initiative – Allotment Watch and how it can help us make all our sites more secure. 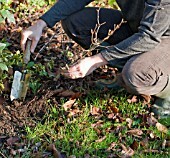 The planting day is on the 27th April starting at 10 am. If you would like to attend please do. If you need any more info or directions please email Gary Johnson gazza7478@gmail.com. Please bring warm cloths, gardening gloves, and a hot flask and/or snacks to keep you going.